Removal ProcedureDisconnect the negative battery cable. Refer toBattery Negative Cable Disconnection and Connection.Remove the camshaft cover. Refer toCamshaft Cover Replacement. Inspect the timing chain tensioner. 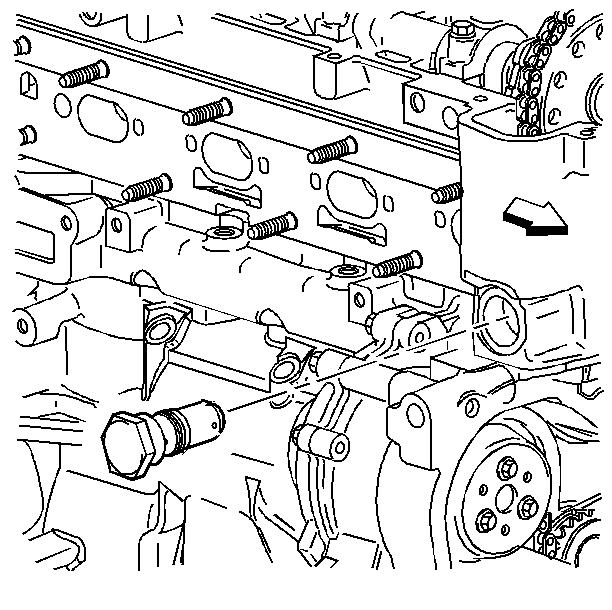 If the timing chaintensioner, O-ring seal, or washer is damaged, replace the timingchain tensioner or O-ring seal as applicable.Measure the timing chain tensioner assembly from end to end.If the timing chain tensioner is to be replaced, a new tensionershould be supplied in the fully compressed non-active state. 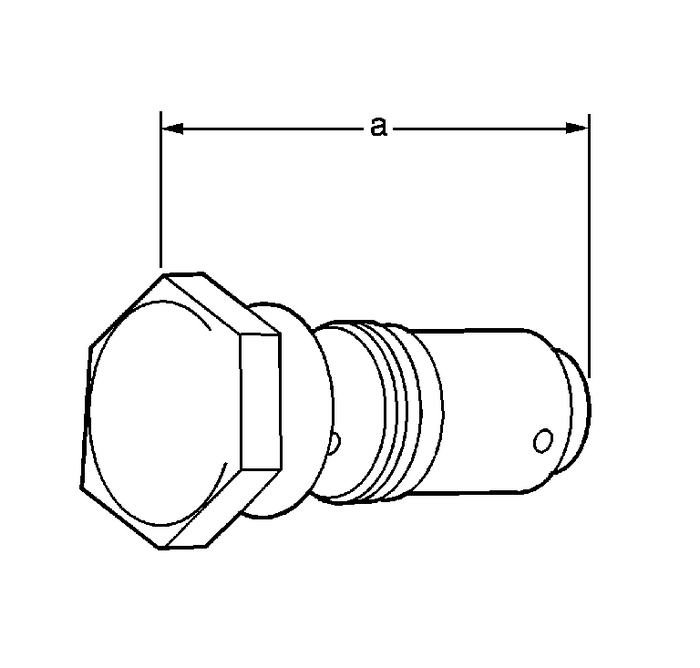 Atensioner in the compressed state will measure 72-mm(2.83-in)-(a) from end to end. A tensioner inthe active state will measure 85-mm(3.35-in)-(a) from end to end. If the timing chain tensioner is not in the compressed state,perform the following steps:Remove the snap ring.Remove the piston assembly from the body of the timing chaintensioner by pulling it out.Remove the sealing collar from the piston assembly.Install theEN-45027-2tool(2) into a vise.Install the notch end of the piston assembly into theEN-45027-2tool(2).Using theEN-45027-1tool(1), turn the ratchet cylinder into the piston.Install the sealing collar to the piston.Install the piston assembly to the body of thetensioner.Install the snap ring. Inspect the bore of the tensioner body for dirt, debris, anddamage. If any damage appears, replace the tensioner. Clean dirt ordebris out with a lint-free cloth.Install the compressed piston assembly back into the timingchain tensioner body until it stops at the bottom of the bore. Donot compress the piston assembly against the bottom of the bore. Ifthe piston assembly is compressed against the bottom of the bore,it will activate the tensioner, which will then need to be resetagain.At this point the tensioner should measure approximately72-mm (2.83-in)-(a) from end toend. If the tensioner does not read 72-mm(2.83-in)-(a) from end to end, repeatsteps-3–5. Inspect to ensure all dirt and debris is removed from thetiming chain tensioner threaded hole in the cylinder head. Note:Ensure the timing chain tensioner seal is centered throughoutthe torque procedure to eliminate the possibility of an oilleak. Install the timing chain tensioner assembly. Tighten thetiming chain tensioner to75-Y(55-lb-ft).The timing chain tensioner is released by compressing thetensioner 2-mm (0.079-in) which will releasethe locking mechanism in the ratchet. 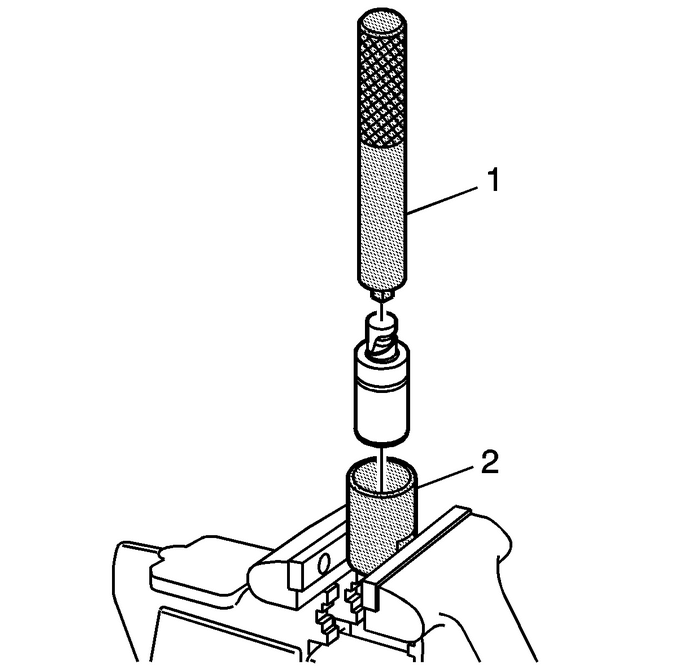 To release the timing chaintensioner, use a suitable tool with a rubber tip on the end. Feedthe tool down through the cam drive chest to rest on the cam chain.Then give a sharp jolt diagonally downwards to release thetensioner.Install the camshaft cover. Refer toCamshaft Cover Replacement.Connect the negative battery cable. Refer toBattery Negative Cable Disconnection and Connection.